Planting your garden with a clear edge gives it definition and structure, rather than having it appear to be floating in your lawn. You can edge gardens with all types of hardscaping or you can let plants do the work for you. Edging plants tend to be low growing and often spreading or mounding in habit. They define the start of your garden, but they also soften the edges, so there is no harsh beginning or end. While many plants make great edgers, here are some that really do the job with style. The soft blue-grays of the artemisia and pinks along this garden edge make the perfect foil for darker plants. Rounded, flowing plants tend to draw the eye along with their curves, so you slowly take in the entire border. There’s a difference in heights, which keeps it from becoming static, but the similar colors do not break the flow. Silvery colors complement all shades of pastels and particularly highlight pink. Repetition is key to making a garden look pulled together. Sometimes you repeat the same plant in different spots in the garden, other times it can be a particular color. 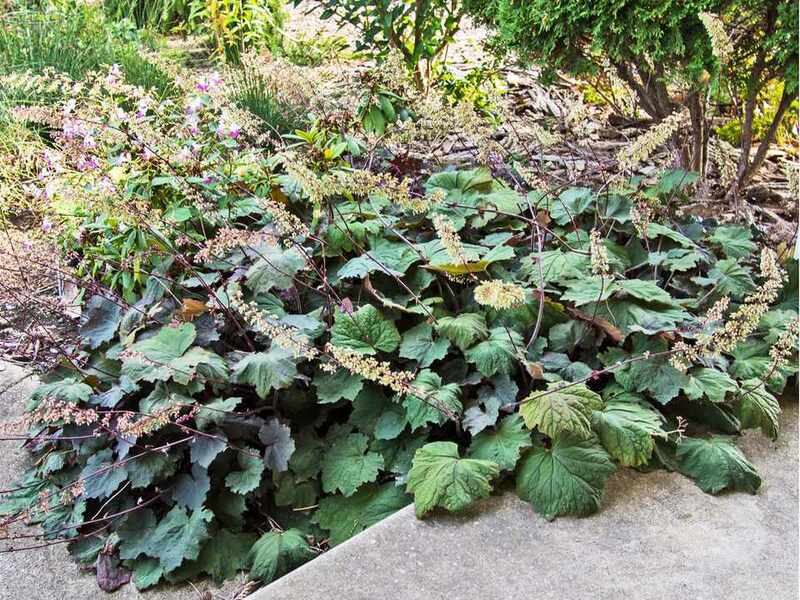 In this case, plant shapes have been repeated, with tall mounding plants, like bee balm, and spiky Veronica placed intermittently among low sprawling geraniums that blur the line between garden and walkway. The similar shades of color have been used to create depth in the border. The spiky but mounded growth habit of the lavender plants adds a dynamic sense of movement. Using dark purple flowering lavender plants along the edge of this border punctuates it with vibrant color that enhances the border's bold color scheme. And it's always nice to put fragrant plants close enough to the edge of a border for you to walk by and rub up against them, releasing their divine scent and adding another dimension to the garden. When edging your border with plants, you don’t have to stick to only one variety of flower. Here’s an edge of phlox, Penstemon, and even lamb’s ear. They all look cohesive together because the pink and purple colors are all similar or analogous in tone, which means they fall close together on the color wheel. The silver lamb’s ear acts as an accent and pulls it all together. The purples and blues further back in the border are made more vibrant by the bright tones framing the bed. A little jolt of color comes as a relief in a mostly green garden and it makes the greens look more vibrant. When you are dealing with an area that does not get full sun, colorful foliage plants are great choices for bringing in contrast. You can’t beat coleus for boldness, variety, and non-stop color. These plants are almost maintenance-free, requiring only an occasional pinching back to keep them lush and healthy. Hosta plants are a classic for edging a garden border, for good reason. They are low growing but cover a good amount of ground. They look good all season long and these days, they come in a wide assortment of yellow, blue, and variegated leaves. Using several different varieties gives a sense of texture, like a tapestry, that frames the front of a border. If you garden in a shady area, Hosta would be ideal. Lamb’s ear is often touted for its soft, fuzzy texture, but it is also a wonderful color in the garden. Massed along the edge of a border, Lamb’s ear is like a bright light that illuminates everything behind it. Even in this fairly monochromatic border, the differences in textures are accented by the striking contrast. Hedges around a garden create formality. However, a hedge does not have to mean proper boxwood. These lavender hedges are the perfect height to give definition to any rose garden, large or small. They enclose without looking too stuffy. Even out of bloom, the gray-green leaves will provide a semi-formal, fragrant frame. The use of two different colors of lavender add to the billowy abundance and make it look like an explosion in the center of the border. Re-purposed objects find new homes and use throughout gardens. These blue and white plates would be attractive enough on their own, but the yellow marigolds behind them are the perfect compliment. The marigolds could easily get lost in the front of this border, but the complementary color of blue and yellow paired together are eye-catching and having the marigolds fall gently on the plates pulls them together. 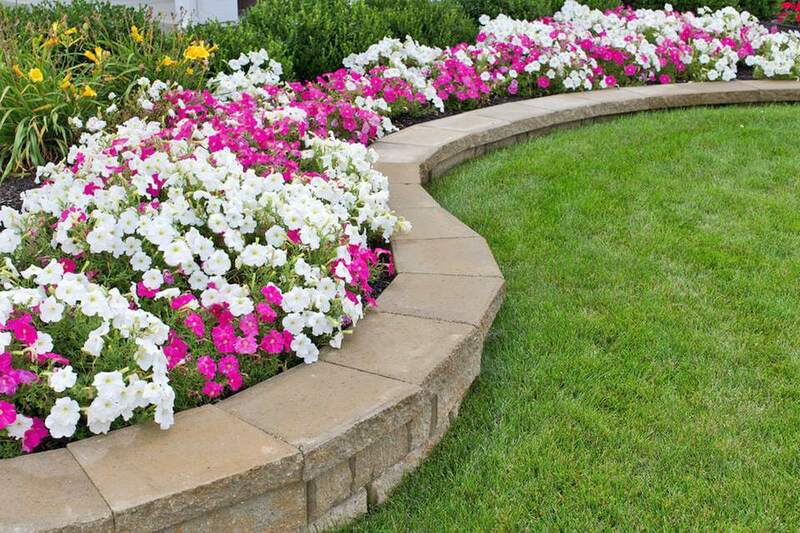 Edging plants do not have to span the entire length of a garden border. Repeating clumps of plants in arresting colors or textures will do the trick. With their brilliant pink color, these dianthus plants are an example of an edging plant stealing the show from the border behind it. Petunias have always been popular in gardens but today’s varieties offer endless blooms and a neat, ground covering growth habit. What could be more perfect for the edge of a border? With modern petunias, you can have non-stop flowers the entire season in just about every color but blue. Paler shades of white and yellow will create a subtle touch, while bolder colors or a combo like this one will pack a punch, with very little maintenance. Few plants are as well behaved, with so little effort, as low growing sedum. The plants shown here have recently been planted, but they will start to fill out quickly and form a lovely mat that will act as a living mulch. The yellow spring flowers help to wake up the border and the chartreuse foliage will remain attractive all season. And since sedum plants are succulents, they will require very little care. When you are edging parallel borders on either side of a pathway, what matters most is a balance. The plants along both edges of this border are the same, low mounding lavender and geranium, spiky sword-leafed Crocosmia and soft, flowing lamb’s ear, however, the edges are complementing, not mirroring each other. Where one side spills over, the other side spikes up. A visitor won’t feel like he is marching down a regimented ally way. The plants are kept more natural and garden-like, even though they are edging the border. If bold colors are your preference, but you don’t want your garden edge to scream, try color blocking your edge. The short gold zinnias are massed in front of a corresponding block of tall red dahlias. Next, to them are subtler ornamental grasses followed by a lighter gold santolina. Then the whole scheme is repeated. It’s a brilliant display without becoming gaudy. Creeping phlox looks amazing when planted near stone. The soft mounds of pale lavender play off the square stone boulders. They are subtle, but they are just enough to create some order within the abandon of grass-like plants wafting in the breeze. Together with mounded and sheared shrubs, they give a framework to this free-flowing garden.